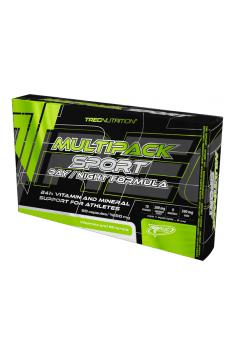 MULTIPACK SPORT NIGHT FORMULA is a mineral complex designed for athletes, enriched with natural precursors of serotonin and gamma-aminobutyric acid – ingredients important for the quality of sleep. The formula also contains magnesium which contributes to normal functioning of the nervous system, thus reducing tiredness and fatigue. The product provides a double amount of zinc which is especially important for men as it contributes to the maintenance of normal testosterone levels in the blood and sexual potency. MULTIPACK SPORT NIGHT FORMULA contains ingredients supporting normal DNA synthesis and metabolism of proteins, carbohydrates and fats. Multipack Sport Day/Night Formula 60 caps. The recommended portion is 1 tablet 2 times a day, preferably immediately after a meal. Wash down the preparation with 300 ml of water. Among people practicing intensive and regular physical activity, the need for minerals and vitamins is increased, therefore it is extremely important to take care about supplementing them. Multipack Sport Day Formula (white capsule): Maltodextrin; capsule shell (gelatin, dye - titanium dioxide); anti-caking agent - magnesium salts of fatty acids; Multipack Sport Night Formula (black capsule): Maltodextrin; capsule shell (gelatin, dyes - iron oxides and hydroxides, titanium dioxide); anti-caking agent - magnesium salts of fatty acids]. Pure gamma-aminobutyric acid in the form of a convenient powder. Reduces excessive emotional tension.